As the preferred salon for men in greater Milwaukee, we pride ourselves in delivering the best cutting, shaving, and grooming services in town. We know that when you look better, you feel better, and you perform better. That’s why everything we do is focused on helping you achieve your best look. It seems like there are a lot of creative ways to entice guys into salons and barber shops these days. But at 18|8 Elm Grove, we don’t get caught up in the gimmicks. Instead, we believe we can earn your business by providing great hospitality and expert men’s haircuts. Our stylists and barbers have mastered advanced techniques through extensive training and ongoing education, so they can deliver a style that is perfectly matched to your head shape and hair density. You’re sure to enjoy our relaxed yet sophisticated environment which was designed with you, our guest, in mind. From the robe to keep your collar dry and free from hair, to the individual shampoo bowl at each station, you’ll quickly recognize that 18|8 Elm Grove offers a barber shop experience a cut above the rest. Take a virtual look around, or better yet come out and see the real thing. Grab a cup of fresh ground Colectivo coffee, a hot cup of Rishi tea, or a bottle of Sprecher root beer and head back to your presidential barber chair. Settle in and enjoy your choice of professional salon services, from rejuvenating scalp and face treatments to the classic barber shop straight razor shave. No matter what services you choose, we bring everything to you so you can enjoy some uninterrupted relaxation. Of course, a visit to 18|8 Elm Grove is rarely complete without an expertly crafted haircut. After an initial consultation and shampoo, you’ll get a chance to see what truly sets us apart. Your barber will tailor your cut using a combination of freehand and over-the-comb clipper, shear, and razor work. Our goal is to identify your unique head shape and craft a haircut that not only looks amazing today, but will continue to look great over the life of your cut. That’s why you’ll never see us using the clipper guards, neck trimmers, or thinning shears that are common at most barber shops. At 18|8 Elm Grove, there are no shortcuts and there is no compromise in our mission to make you look your best. Once your cut is complete, we’ll use the straight razor to clean up your neck. Next comes a rinse, scalp conditioning, and some relaxation under an aromatic Bay Rum hot face towel. We’ll finish with a blow dry and style and take a few minutes to show you how to re-create your look at home. Our belief is that 18|8 guests should look great every day, not just the day they visit us. 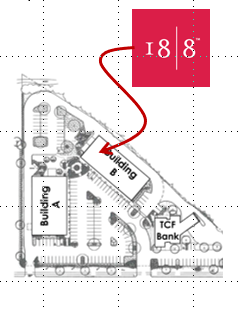 We invite you to experience 18|8 Elm Grove for yourself. We look forward to the opportunity to earn more great reviews. Call 262-910-0188 or book online. Our barbershop is conveniently located where Brookfield, Wauwatosa, and Elm Grove come together on Bluemound Rd. You’ll find us in the Autumn Grove Plaza on the north side of the road, across the street from Target and Trader Joe’s. As the zoo interchange project nears completion, there are new traffic patterns in the area. See our Directions page for the best ways to find us. Convenient online booking with courtesy confirmations. Experience the 18|8 difference today.